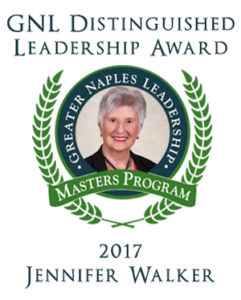 The Board of Greater Naples Leadership is pleased to announce that Jennifer Walker, Class IX, received the 2017 Distinguished Leadership Award. The award was presented at the Celebration Dinner on April 4, 2017. After a successful career in the demanding, high-pressure environment of international public relations, Jen Walker came to Naples in the mid-1990s and began applying her leadership, interpersonal and communications skills to benefit community nonprofits. Her uniquely effective brand of leadership has not only enabled over a half-dozen organizations to better achieve their missions but has left a lasting positive impression on the colleagues and staff who have worked alongside her. She earns high praise for her professional abilities–including her exceptional marketing and strategy expertise–but equally for her personal qualities: her inclusive approach to making sure every voice is heard; her courage in dealing straightforwardly with tough issues; her willingness to embrace major beneficial change and work tirelessly to gain board and community support for it. Her quiet natural leadership style inspires cooperation and helps organizations move forward. Here are some highlights of Jen’s leadership accomplishments. As President of the Greater Naples Branch of the American Association of University Women, Jen advocated for women’s and girls’ causes before elected officials, raised funds for college scholarships for older women to complete their education, and helped launch a highly successful county-wide program to encourage middle-school girls to pursue math and science studies. Jen also served on the boards of the League of Women Voters of Collier County and Pace Center for Girls as Communications Chair. After participating in Greater Naples Leadership Class IX, Jen joined the board as Communications Chair and was elected GNL President in 2010. She led several change initiatives, including restructuring and transferring GNL’s financial and administrative operations to a new firm, encouraging GNL community service through a mentoring program and a new online information system to share nonprofit opportunities, achieving a new high in alumni renewals through targeted communications, and expanding the alumni program to focus on continuing education. During 2010, Jen was invited to join the board of First Book-Collier County (now Books for Collier Kids) as Communications Director. She garnered regular publicity in the media, including coveted placements in the Naples Daily News’ KUDOs section and Guest Commentaries, to share BCK’s mission of providing a steady supply of brand-new books to disadvantaged young children. Recruited by Collier Health Services (now Healthcare Network of Southwest Florida) to join a strategy task force and later, the Foundation Board, Jen played a lead role in redefining, renaming and rebranding this major healthcare service and worked tirelessly to gain support for the new direction from the organization’s management and Foundation board. 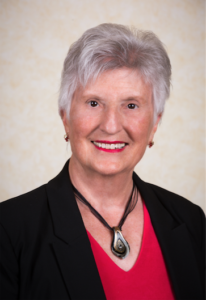 Jen was elected to the Community Foundation of Collier County Board of Trustees in 2011, serving initially on the Grants Committee, the Center for Nonprofit Excellence (CNE) Committee and the Marketing Committee. In 2013 she managed the successful transition of CNE to Hodges University, where it continues to offer training for nonprofits. In 2015, she was elected to a two-year term as Foundation Chair. Jen and the new President and CEO, Eileen Connolly-Keesler, have forged an enormously successful partnership that has helped CFCC become a major philanthropic force in the community. 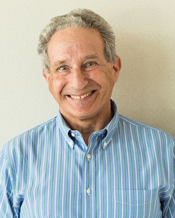 Among other accomplishments, CFCC launched a capital campaign to raise $2.1 million to purchase their own office space, followed by a successful “cash match” campaign that Jen led to pay off all outstanding debts. Under Jen’s leadership CFCC organized several celebrations of its 30th anniversary, including Turtles on the Town, a major community project to benefit the arts, environment and philanthropy. The Foundation launched Give Where You Live, a 24-hour on-line giving campaign that raised over $4 million for local nonprofits in each of the last two years. Recently, the Foundation launched the Scholarship Connector, an innovative service offering a one-stop online location for high school students to find and apply for college scholarships. In sum, every organization Jen has served has benefited significantly from her dedicated and capable leadership. Jen has always left a place better than she found it. Jen received a B.A. in Political Science from Douglass College, Rutgers University, and an M.A. in International Relations and African Studies from the University of California at Los Angeles, where she was named a National Defense Foreign Language Fellow. She enjoyed a dynamic career in public relations, public affairs and advertising with J. Walter Thompson and Hill and Knowlton, rising to the position of Senior Managing Director at H&K while serving as worldwide account director for major clients such as PepsiCo, Bell Atlantic (now Verizon), DuPont, Deloitte and Touche, and GTE Mobilnet.